A lot had happened in the last few hours, the biggest event was to see the Kelt forces suddenly leave, then not long ago most of her German countrymen and women were being ordered back home to be replaced by smaller numbers of other NATO nation forces. Fortunately for Elke she was attached to the SGC so her position was sound; besides she much preferred the company of Americans, English and Australians than the stiff too formal people of her homeland. After sorting out a great deal of paperwork the base CNO began her rounds, only to be interrupted by the sound of a high pitched ski mobile engine. Stopping by a fogged out plastic window near triage, she wiped away the frost to glance out. "Andy! Emily has returned." A mere call to the CMO was all that was needed, she then carried on with her work. Hiya, big Stargate fan. Hope you are as well. The skidoo slowed to a stop in front of the hospital building, allowing Ryan to say "Would you like a hand getting inside? "Ryan slipped off of the skidoo and then he helped keep Emily upright in the strong gusts of wind on their way to the door. They reached the door quite quickly with Ryan having to put his full weight on the door to open it against the harsh winds. After both managed to enter, Ryan spoke up and said "Do you mind if I grab a cup of Joe before I go?" Ryan gave a little chuckle at his bad rhyming, before taking off his gloves. After pushing the hood on his parka back, he looked around the room and saw the break room area of the hospital. Upon spotting a coffee machine in one corner he hurried over and called out, "Can I get you anything while I'm over here?" He took his time making some coffee for himself along with her drink. When he finished with them he brought her back hers while drinking his. They sat in comfortable silence for a few minutes as they warmed up. Eventually Ryan said "Well, I should probably report in and let HQ know that you are here. Need anything else before I go?" Never again shall I bow before a false god! “That’s great!” Andy shouted back through the open door of the office where he sat, working on the staff roster that left a few holes in it now when the Germans were pulling back, It wasn’t a complete mess since the Germans hadn’t been totally independent yet, but this sudden change meant they were spreading themselves a bit on the thin side, again. But as long as the flue was kept at bay, they’d manage. Rumors said peace talks might start in a near future, and being in the position he was he could only hope it was sooner rather than later. "Merrenden base this is the captured ship Raven, calling Merrenden base. We have one serious wounded Captain General Lanam Banene, come in please!" Being appreciative Em thanked Ryan for his help letting him do the heavy lifting for her while she carried her smaller tote bag. Once inside she was so glad for the warmth the almost immediately began to permeate her clothes then into her bones, she couldn't ever recall in her life ever having spent so long in a virtual freezer, for no matter how much they tried back at the Aid Station, how many fires they had going, it never really got warm. The worst of it was the moment you stepped away from either the stove or the 44 gallon drum that served as a fire place, you froze. Taking a moment to enjoy the hot coffee she noted that it was far superior to the rationed stuff she had been consuming for the last 2 weeks, that was a plus. She sipped it slowly before she thanked him again. "I guess you..." Her mouth hung open as she listened to the radio call coming from the main desk not ten feet away. The duty Nurse wasn't around, a moment of panic welled up in her throat. "Don't move Ryan, we may need your help." She was well aware that most of the medivac crews were up North, plus she never saw a rescue helicopter on the hard stand as they came in a moment ago. Not knowing immediately what to do, she ran to Andy's office a short distance away, barging in without any announcement. "Andy Hi!...um, er..." She stuttered. "I'm back and there is a SOS call on the radio right now." 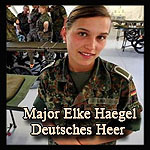 Elke was more than sure Emily was alone other than the soldier who brought her back, she doubted he was injured for it had been proven those ski mobiles were hard enough to manage able bodied let alone wounded. She adjusted the drip on two more patients before answering. "No Andy I believe she came alone except for whoever that was bringing her back. I have a request also to release Master Sergeant Franklin for light duties, he's walking, in good spirits with feeling returning to his fingers. Over." Thomas was one of the very first patients they had with the dreaded frost bite, fortunately for him it wasn't severe, bad enough though to take him off the battle lines much to his dismay. Nothing much had changed, people still did the same things as they did two weeks ago, which in turn gave cause for Em to giggle watching the 'Old man' fly off in a flurry. She followed him back giving him some space, before turning again to Ryan. "This is a typical day, we're short staffed since some our medics from the NATO force were pulled out. Still we get things done. I take it you've done some rescues from choppers in your time?" She knew that the air borne rescue section were down on man power as well, if it came to doing it she knew she could, but she also knew Andy would say no. He wasn't about to risk one of his surgeons dangling from thin wire beneath a helicopter at sea. "Merrenden, we are aboard the Raven a Forerunner ship captured by Captain Lanam Banene of the Cavaleiros. He has been gravely wounded and we are yet still four hours from port, position twenty two degrees south of the estuary mouth, twenty five leagues west. Over." Ryan started to shift nervously, "Well I took the training course as per requirement, however, the one time I was involved in an attempted helicopter rescue was kind of an abysmal failure. The helicopter was shot down by Iraqis while we were inbound to pick up a busted up squad of jarheads." Ryan gained a far off look in his face, "It was not a pleasant experience." He shook off the look and took a sip of his coffee. "Is there anything I can do to help with the SOS?" Pulling her parka close around her head, as Em was still feeling just a little chilled despite the apparent warmth of being inside the tent, she listened to him then gave him a grin at the end. Briefly she told him her history, starting off as so called child prodigy (a term she found absurd), going to Uni and medical studies just after her sixteenth birthday but then having to drop out in her fourth year to help support her father and brother after her mother died. Joining the Royal Australian Navy as a medic, then medivac rescue diver, she became a Petty Officer before being selected for the Stargate program. She was supposed to go to Atlantis but was diverted at the last moment and sent here to the Alpha Site, busted to Able Seaman a year ago for insubordination but finally her skills were recognized and she was reinstated as an Intern and Sub Lieutenant pending her final medical exams...which was in a months time. "Sooooo, I know where you're coming from Ryan. My last three years here has been doing over the water and mountain helivac rescue. But...that guy there.." She lowered her voice as she pointed to Andy. "...will just say no if its even suggested I dangle off the end of a rescue winch. Want the job?" She had to admit, it was exciting and she missed it. "Understood. Be advised, the weather may turn before you arrive, wind factor changing west to south west, currently at 20 knots. Over." Ryan looked at Emily apprehensively, wondering if he should accept the mission. He turned to look at the man Emily had pointed out and let out a reluctant sigh. "Yeah," only to have been interrupted by the Doctor's question. Ryan then interrupted Emily before she could respond and spoke to the Doctor, "No sir you won't, because I'll be the one to go. He whispered under his breath "I've got to get better at denying the women in my life." He let out a small chuckle at his own joke before turning serious. "Tell them that I will be there in half an hour." Ryan got Emily's help making sure the helicopter was reader for a rescue operation. He then set out to go meet up with the in trouble ship. Em was playing hooty owl now with her head swiveling back and forth just like one of those big eyed birds do. Then it struck her, as she had noticed earlier when she came in with Ryan, the chopper pad was devoid of crew, because those who weren't off in support of the army in the north east, were at Foreston which meant Robyn Hatfield and her friends. "Oh Jesus what a pickle. Andy, we need to keep that line open but I need to call Commander Renner. I can use my phone for that." She turned to the Airman. "Stay where you are Ryan, no sense in being out there freezing until the chopper crew arrives." Then like a someone possessed she off doing something else, which was going through the Nurses station drawers looking for her cellphone that she had left behind. "And no, what he said." She replied to Andy pointing at Ryan. "Although I will still have to go, just not get dropped down on a skinny wire in the wind and snow." She'd done enough of that to last a life time. With the little Nokia in hand she hit the speed dial. She was thankful it was ringing.